Inside: Parents often struggle to teach their child how to share. There’s a reason why it’s such a struggle. 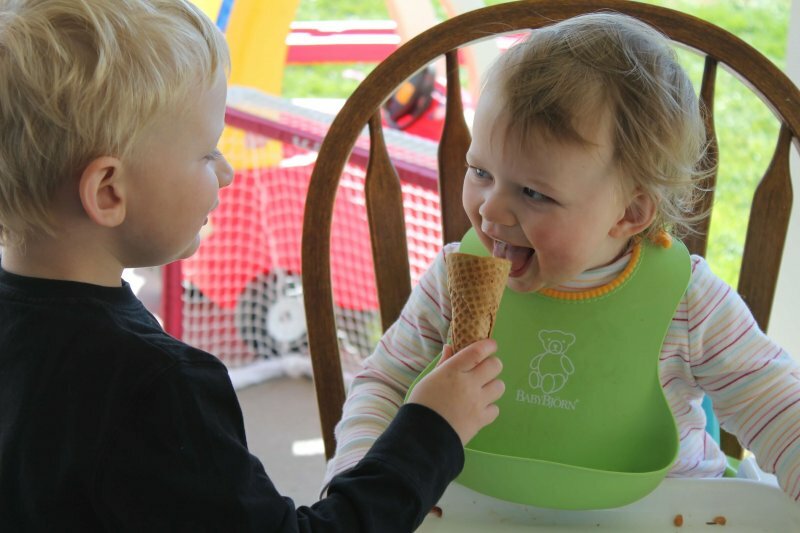 Kids aren’t really wired to share their things. So to end sharing struggles once and for all, you only need one simple phrase. It will change everything. We are expected from a very young age to share our stuff. We have to share our treasured toys. And share our parents’ attention. 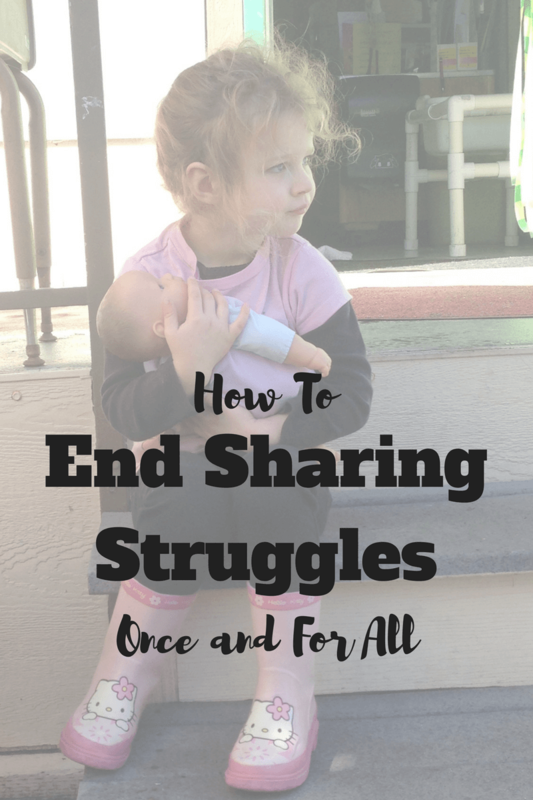 I’ve sat through enough Mommy and Me classes to see firsthand how sharing can get ugly. Kid A has a toy. Kid B wants it. Now. So, the teacher sets a timer and when it goes off, Kid A has to relinquish the toy to Kid B. No questions asked. Or Kid A is quietly playing with a toy. Kid B grabs the toy away. Kid A starts crying and is told by an adult that he needs to share his toy with Kid B. The toy stays firmly in the hands of Kid B while Kid A is lectured on why he needs to share the toy. As a child I was–in my mind at least–always Kid A. I was forced to share all of my things because all kids were forced to share their things. And guess what? I still hate to share. It’s kind of a running joke in my family how much I hate to share. I don’t like it when someone helps themselves to my French fries. Or finds my secret stash of Halloween candy. And it annoys me to no end when my husband “shares” my towel when he showers first. So I’m teaching my kids that they don’t have to share. Now don’t roll your eyes at me or judge me for being one of those parents. Sharing can be a lovely thing. It’s very generous to give what you have when you see others in need. I model my generosity to my children by offering our change to someone standing on the corner. We lend our truck to friends who are moving. We share treasured books with people who haven’t read them yet. We share licks of our ice cream cones. But the only way sharing stays a positive thing is when you’re not forced to share. Children usually have their toy disputes settled by an authority figure who admonishes them to share. Children often have to give up their stuff on command. Even if they had it first. Even if it was theirs. Even if they were right in the middle of playing with it. And now as the “authority figure” of three young kids, I am constantly bombarded by toy disputes. I feel empathy for the kid who had the toy first. I feel empathy for the kid who desperately, right now, wants it (and is hysterically making their case be known). Because sharing is hard. Especially for our youngest kids. And early childhood education teachers will tell you that before kids can share, they need to feel a sense of ownership. 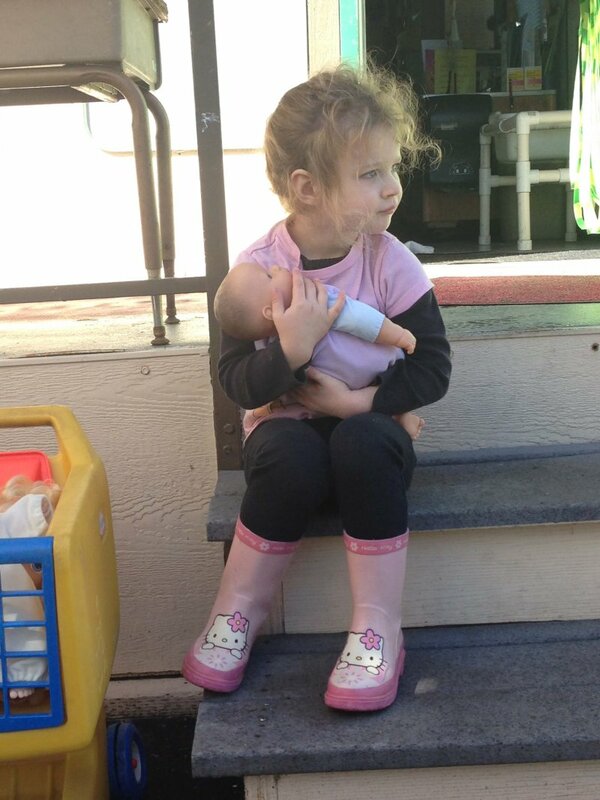 Young children view their prized play food or baby doll as an extension of themselves. So if they’re forced to give it up before they’re ready, in their minds they are literally giving up a piece of themselves. 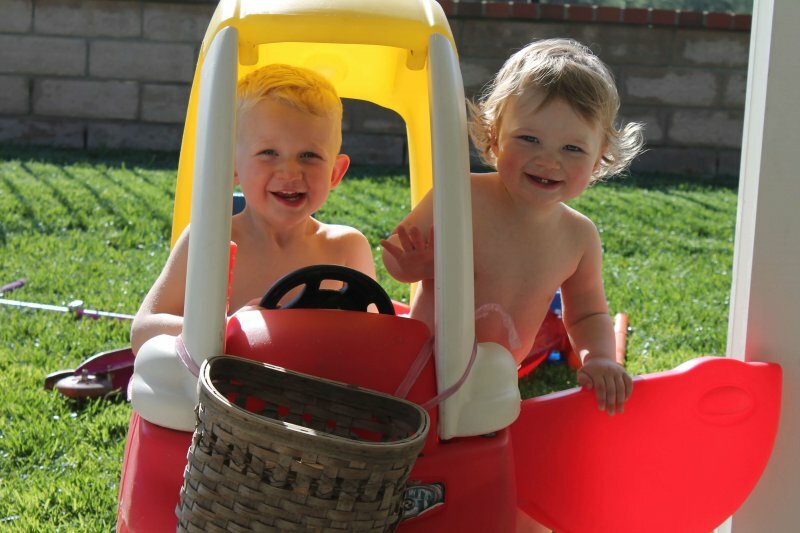 Children will get this sense of ownership as soon as they feel like they have had enough of the toy. When they feel “full” they will willingly, and with a generous spirit, pass it to a friend. This emotional fullness transfers to much more important areas of life than just sharing our toys. The same need to have “enough” as children will manifest itself in adult life as well. As adults, we are able to share love, acceptance, and tolerance if we ourselves have felt loved or accepted or tolerated enough. If we are “full” of love, it is easy to share it with others. So if children are given the time to feel ownership of their physical possessions, they will be intrinsically motivated and emotionally ready as adults to share less tangible things. They will know how good it feels to share what they have enough of. Turn-taking eliminates my kids clinging to their prized possessions with the constant fear that I will take it away and arbitrarily give it to their sibling. So I have stepped back and do not decide who gets what toy ever since I taught my kids two empowering phrases that encourages turn-taking, and ends sharing stuggles. That’s it. So simple. But so powerful. 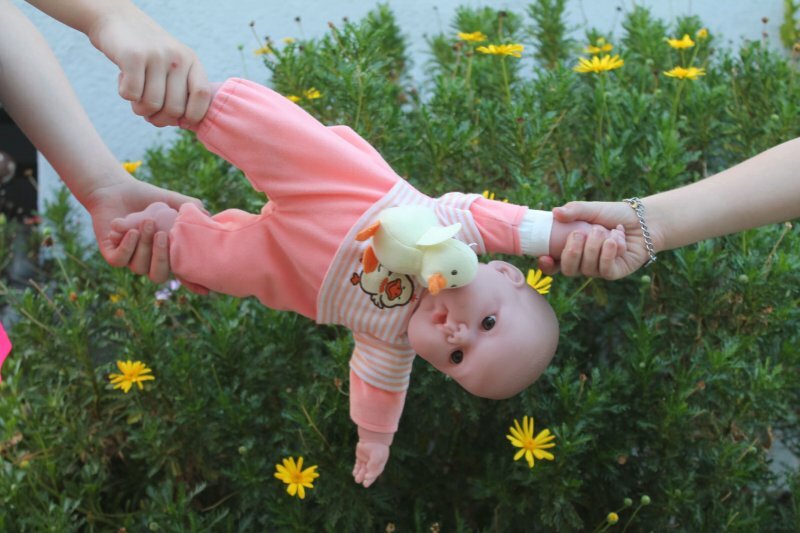 Once they are reassured that they, and they alone, decide when to give up their toy, my kids’ white-knuckled grip on their favorite baby doll loosens. The crazed I-will-never-let-it-go look fades. And you know what? After being asked for a turn when they’re done, most kids pass their toy over within a few seconds or minutes. Because they know they can ask for a turn and they will get it back. And they control the timeline. Not an adult. There are several reasons why this turn-taking option has replaced forced sharing in our family. First, for the kid who has to wait, delayed gratification is a necessary life lesson. Kids need to wait. It’s okay to wait. Patience really is a virtue. Second, since it will be their decision to end their turn, kids will experience the joy and gratification that comes from wanting to share or take turns. Physically handing over your toy to a friend or sibling when you are ready feels uplifting, generous, and kind. But most importantly, the child who is not forced to share will gain a sense of security and will feel in control. So maybe, just maybe, if my kids are never forced to share their toys and are never required to hand over their treasures, sharing will stop being such a dreaded thing. Our kids can leave our generation’s “baggage” of forced sharing at the door because it won’t ever become their baggage. They’ll feel as if they have enough. Enough tolerance. Enough love. Enough acceptance. And that will then lay the foundation for them to share their love, acceptance, and tolerance with the people around them. And their French fries with me. 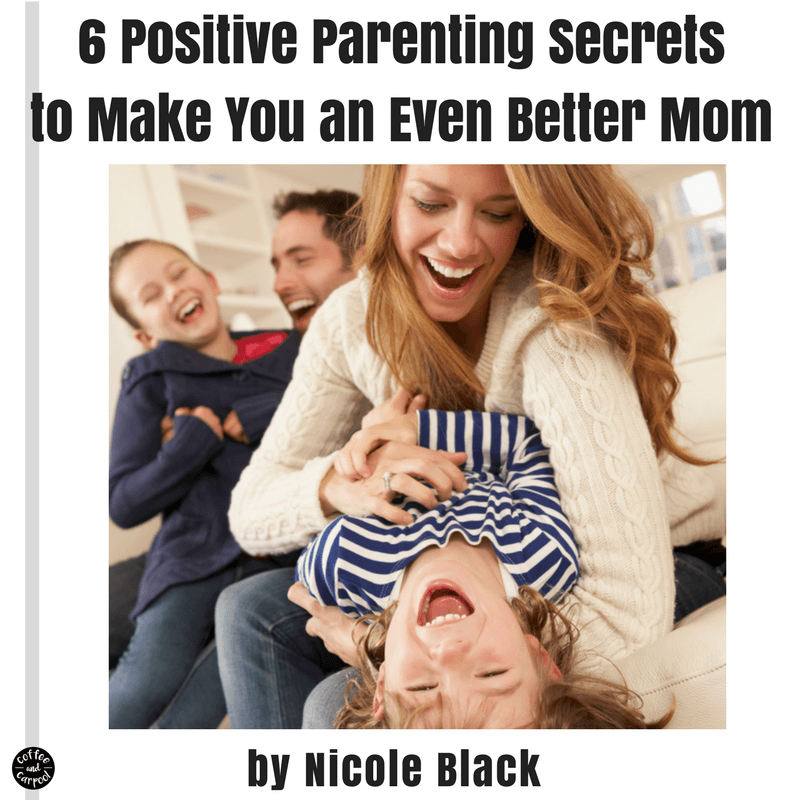 Want more Positive Parenting Tips that will make your life easier and your kids the best versions of themselves? Need more proof that this actually works? I completely agree with this. Kids should be able to feel a sense of ownership over their belongings. Yes! It leads to a more self-assured, confident child! I love this!! We always try to teach our daughter that if she doesn’t want to share she doesn’t have to. I like the phrase “can I have a turn” though rather than “can I have the toy.” Definitely revamping my vocab! It works like a charm, even years past toddlerhood. My ten year old still needs reminders to just ask for a turn from her siblings and it works! And yet, it’s still the way of the parenting world… People sometimes look at me crazy when I tell my kids they don’t have to share! Yes this is great and I agree but what about when you have a non verbal two year old? His brother can tell him all he wants “when I’m done” but if the two year old doesn’t understand and can’t ask “May I have that when you are done”. It kind of breaks down. I was a preschool teacher for years so I agree but now having my own children it’s hard to put into practice when the line of communication breaks down between the two children. It is hard to put into practice, but it takes just that…practice. Could you try a sign or a hand gesture for the nonverbal kiddo? Something easy and recognizable? You could have the older kiddo practice with the sign and with a toy that your two year old wants. Have your older son show the sign for “you can have a turn when I’m done,” then have him wait a few seconds and then hand it over, giving the sign again. Keep practicing and adding more and more time where the two year old has to wait for his turn, while still using the sign. Making it concrete and showing your two year old that waiting pays off might help him grasp the concept faster. Hope that helps!